Here's a blue-plate special you can make at home: cheesy, potato-topped meatloaf with BBQ sauce. No tips, thanks! It's our pleasure to serve you. Mix meat, barbecue sauce, bread crumbs and egg. Shape into loaf in 12x8-inch baking dish. Bake 55 min. Meanwhile, bring water to boil in medium saucepan. Add milk and margarine; stir in potato flakes. Add cream cheese; stir until completely melted. Spread potato mixture over meatloaf; top with Kraft Singles. Bake 5 min. or until meatloaf is done (160°F) and Singles begin to melt. Serve with a steamed green vegetable, such as green beans, and a whole wheat roll. 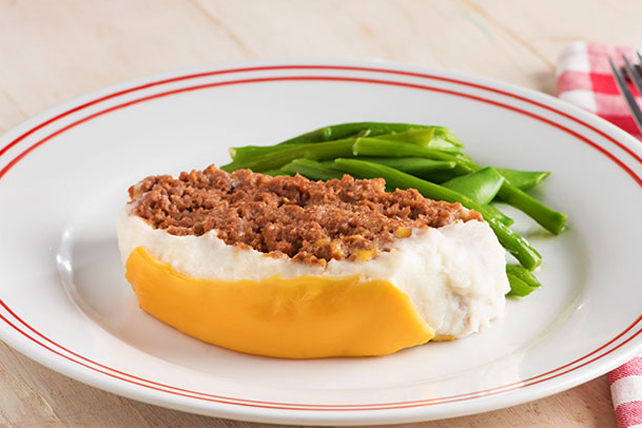 Substitute extra-lean ground turkey for the ground beef.